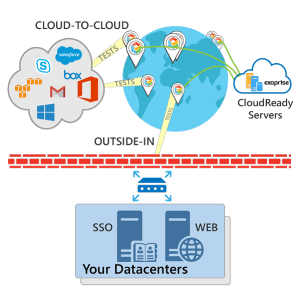 Exoprise CloudReady is the leading solution for Office 365 monitoring including Exchange, SharePoint, Skype for Business, Microsoft Teams, ADFS and MORE to detect, diagnose and fix performance issues fast. 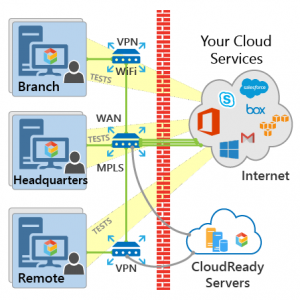 With CloudReady you know about outages immediately — even before Microsoft knows itself. Online communication and collaboration is mission critical. If Exchange Online, SharePoint Online, Skype for Business Online is slow or down, so are your users. When that happens, it’s your job to find and fix the problem whether it’s in your network, at your ISP, or at Microsoft. Office 365 monitoring is a challenge. Traditional monitoring tools can’t see past your firewall, and the Microsoft Office 365 Service Health Dashboard has no visibility outside Microsoft’s network. If these are the only tools you have, you’ll find yourself in the dark the next time you’re trying to figure out if there’s an outage or where the problem is. 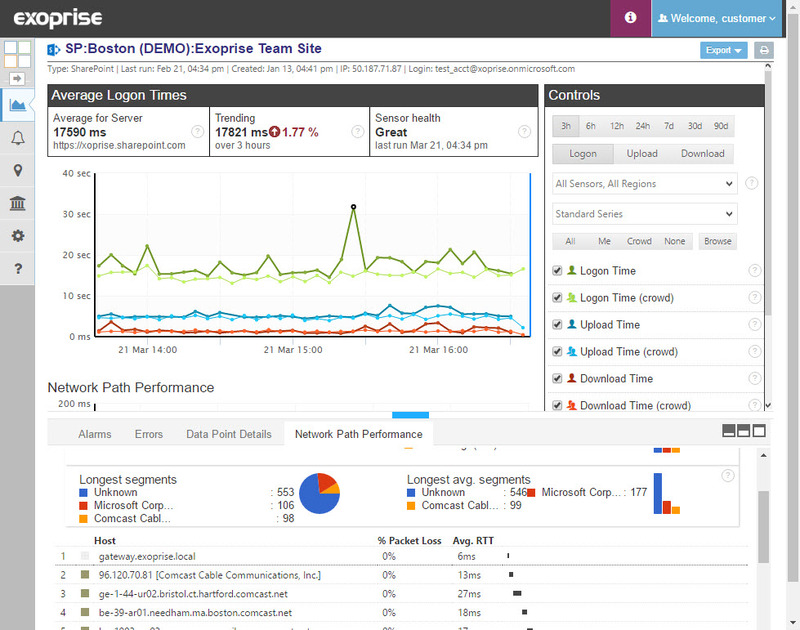 You need an application performance monitoring solution with end-to-end visibility into the end-user experience from your network to Microsoft’s cloud. Instantly test and compare your network performance for all of your cloud services from any location. Benchmark your network. 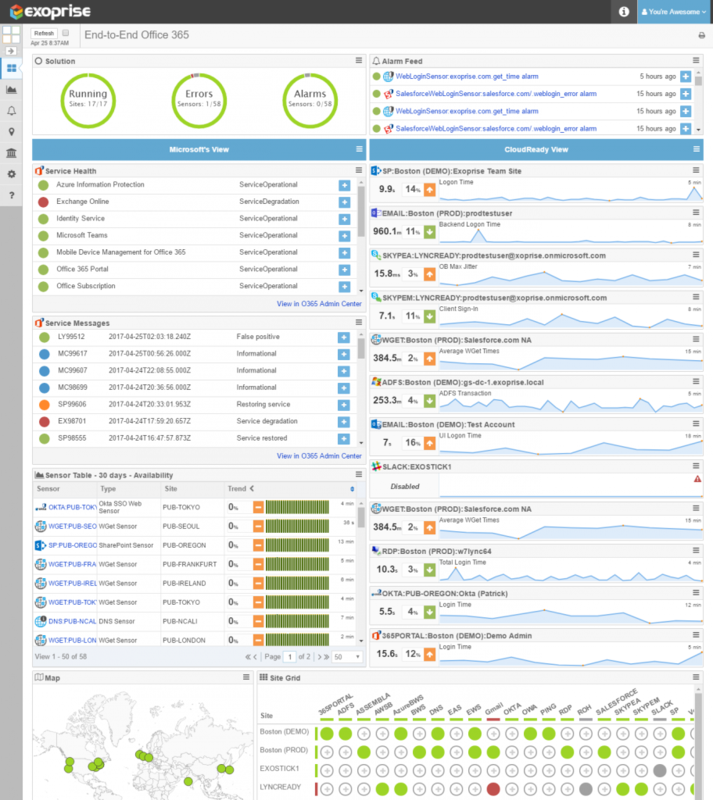 Capture DNS lookup performance for any cloud service. Test your DNS response, provider uptime and caching. End-to-end comparisons for ISP, Backbone and Cloud Provider performance. Historical & real-time metrics gathered for free. CloudReady® is an application performance monitoring (APM) solution specifically designed to address the needs of organizations using mission critical SaaS applications like Microsoft Office 365. 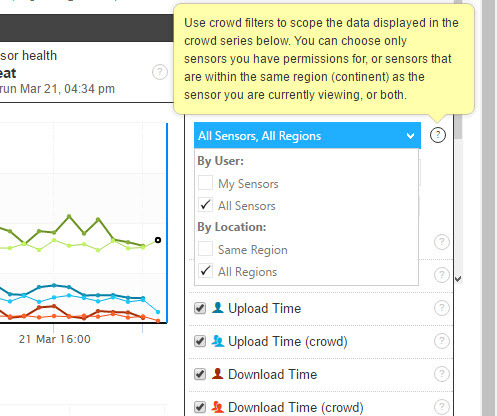 Our Web and Network Sensors enable you to monitor other any SaaS application from the same console. CloudReady supports ALL of the leading cloud services like Salesforce, Dropbox, Box, Workday and more. Monitor your own internally developed web applications from behind the firewall or out in the cloud from our public Points of Presence (POPS). CloudReady is tightly integrated with the real-time Office 365 Service Health Communications status to give you a complete perspective into your mission-critical SaaS services. See Microsoft’s view of their datacenter infrastructure at the same time as you actively test your own infrastructure, network, ISPs and dependent services. Subscribe to our weekly Cloud Health Report to see how Office 365 performs each week. Measured from 1000’s of locations throughout the world. Read more about the capabilities and share. Most Office 365 outage and performance problems are caused by downstream service and network failures or configuration problems. 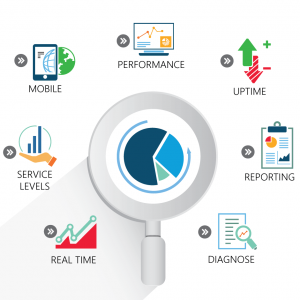 CloudReady has many unique features that give you the insight you need to optimize your environment, before, during, and after migration. Prevent problems and quickly pinpoint the root cause when outages do occur. Measure and report on SLA trends over time. With crowd powered Office 365 monitoring by Exoprise, you can move to the cloud without living in the dark. LAN, WAN, Internet or the Provider? 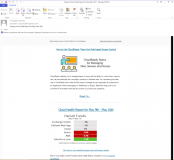 Monitor Exchange, SharePoint, and Skype4B from where your users access them. Branch office, HQ, WiFi, VPN, laptop and more. Monitor your Single Sign-On (SSO), MDM, and internal applications from our points-of-presence.